Gallatin junior Alex Carr performed with his band at Sunnyvale in Brooklyn last Saturday. Last Saturday up and coming lo-fi rocker Alex Carr, a Gallatin junior, jammed out at Sunnyvale on Saturday, the dimly lit hipster haven in Brooklyn. 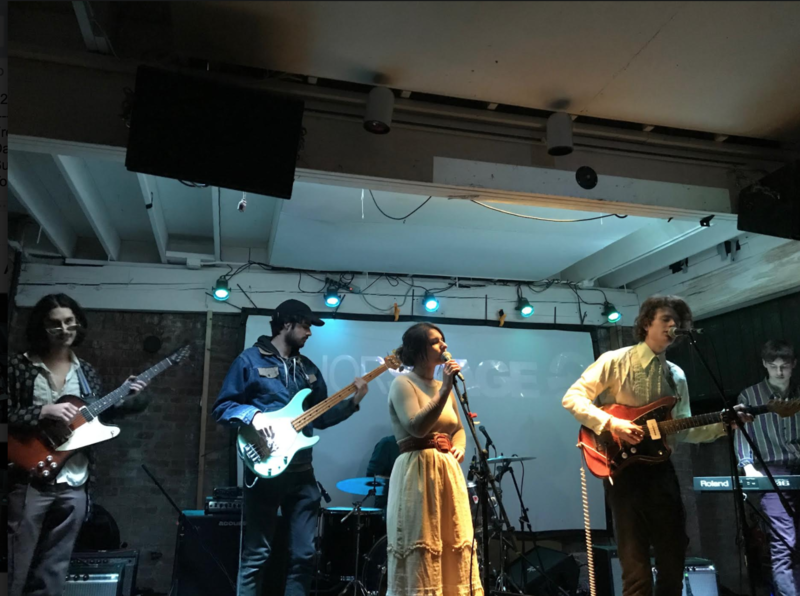 As is the norm with much of the real estate in and around Williamsburg, the venue appeared to be a retrofitted industrial building now perfectly suited for live performances. Carr and his backing band is made up of Carr, vocalist and guitarist, is joined by his friends Alex Potter on guitar, Greg Tock on drums, Zoltan Sindhu on bass and Miles Grossenbacher on piano. All are juniors in Steinhardt’s Music Technology program, with the exception of Carr. After appearing on stage and setting up their equipment, they jumped right into the first track with no introduction. The first tune glided along in a psychedelic haze, driven by a thick and muddy bass. The band was subdued and introspective throughout the tune, a demeanor that they carried throughout the performance. Keeping with the theme, Carr thanked the audience for coming out and proceeded to jump straight into the second track, a saccharine sunny song full of phaser and distortion. Carr reached for deep, guttural tones, and at times, the raw emotion was clear and easy to hear. However, the instrumentals consistently tended to drown out Carr’s vocals, and this was not exclusive to this tune. Carr and his crew, despite the minor mixing trouble, clearly had their act together song after song, each one vibrant and full of energy. However, as the tracklist continued, the band’s sound began to grow repetitive. A mix of Mac Demarco meets MGMT was a welcome one, but they needed to add some sonic diversity to the mix. Thankfully, one of the tunes later on in the set did just that. Carr explained that he wrote it for Olivia Jane Reinertson, a singer who was on stage with the group and a junior at SUNY Purchase College. It was also their newest song and had never been played live. It was a bona fide slow jam, rife with melancholy. The harmonies between Carr and Reinertson were hauntingly delicate. It was easily the highlight of the set and a promising indicator of what’s to come for Carr’s music. The last two tracks were memorable in their own rights. The penultimate tune started the song off on a high note, and midway through Alex sung with a croon that vibed well with the instrumental. The closing song was a fitting closer, with strained vocals that meshed with the somber instrumentation making for a definite send off song. Despite a somewhat repetitive sounding start, Carr and his ensemble definitely added variety as the set progressed, with their newest track being the strongest indicator that Carr is looking to shake up his sound. There’s also a lot to be said about a band this young having put on a good show, an exceedingly rare sight in an arena dominated by solo artists. Building a certifiably unique sound takes time, especially as a group. The performance at Sunnyvale is proof that Alex Carr and his band have planted the seeds for what could be a very fruitful career. Listen to Alex Carr on SoundCloud and Bandcamp.